It will be all change in May as Kyrgyzstan is set to join the Eurasian Economic Union (EEU), meaning migrants in Russia will no longer need to obtain special work permits. But workers like Nurbek are uncertain how things will play out. Around 33 percent of Kyrgyzstan's GDP is attributed to remittances from migrant workers in Russia, reflecting a regional dependence on Moscow that has only increased since the fall of the Soviet Union in 1991. 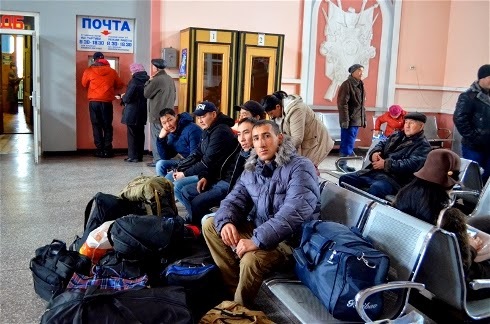 Russia’s Federal Migration Service (FMS) puts the number of documented Kyrgyz workers at around half a million, but experts believe at least another million work there without proper permits, mostly in the construction or service industries. Twenty-year-old Bekmirza works seven months a year as an undocumented security guard at a shopping centre in Surgut, a city at the western edge of Siberia that has seen a boom from local oil and gas production. Like many migrant workers, he returns home every winter to visit family. “I make 31,000 rubles ($579) a month, where a Russian would make 45,000 rubles ($840) for the same job,” he told IRIN. Laws regulating migrant workers in Russia have become increasingly restrictive in recent years. In January, new rules made it more difficult to obtain work permits and easier for the authorities to find and deport undocumented workers. New arrivals have 30 days to register their residence, obtain a certification of their skills for their desired industry, translate their passport into Russian, find medical insurance, pass a medical examination, and pass an exam on Russia’s language, history and laws. It's a daunting process, and even if you get all your paperwork in order, Russian administration is often unable to cope with the backlog. On 7 April, a migrant worker from Tajikistan died at a processing centre in Moscow after spending two days in line with nearly 5,000 other applicants. Violators are added to a blacklist, a database of migrants set up in January 2013 for those found to be breaking administrative rules in Russia and subject to deportation. Around 60,000 Kyrgyzstan nationals are currently on the list. “The law has changed quickly, and many more people are being deported than before,” Salima Ismailova, who manages the migrant workers centre in Osh, told IRIN. In January and February, more than 1,000 migrants came to the centre for consultation on how to return to Russia after being deported, more than double the number during the same period in 2014. Anti-immigrant feeling among ethnic Russians, spurred in part by concerns over Islamist militancy in the Caucuses and the Middle East, has put a spotlight on Muslim migrants from across the region. Around 88 percent of Kyrgyzstan's population is Muslim. Falling oil prices and international sanctions over the war in Ukraine have taken a heavy toll on the Russian economy. The ruble lost 68 percent of its value against the US dollar in 2014, occasionally trading at less than the Kyrgyzstani som. The official number of Kyrgyz migrants has remained roughly static despite the ruble’s decline, but remittances fell to $1.367 billion for the first 11 months of 2014, compared to $1.447 billion for the same period in 2013. “Some people are returning home after the ruble dropped, but most, like me, are not. We need some kind of work, and we wont find anything here [in Kyrgyzstan],” said Bekmirza. Given the backdrop, the migrants are obviously anxious about what will happen next month as Kyrgyzstan formally joins the EEU, forming a unified economic bloc with Russia, Belarus, Kazakhstan, and Armenia. In addition to the dropping of trade tariffs, the accession agreements assure the “free movement of labour” within the union. “This means our migrants will not have to pass this very complicated procedure of obtaining a (visa), and will be on the same level of competition as Russian natives,” said Tatiana Zlobina, a researcher at the American University of Central Asia in Bishkek. The labour agreement was the result of lobbying by more than 25 NGO's from Kyrgyzstan, Kazakhstan, Tajikistan, and Russia who formed a group called Central Asia on the Move in 2012. Is the pact a double-edged sword? Bekmirza, the security guard, now works without proper documents. Having them would mean his employer would have to report his income to authorities, pay taxes, and offer the same salary paid to Russian nationals. “Once we enter (the EEU), things might become easier for us, or we might find ourselves without work altogether,” he told IRIN. Nurbek Umarov, a researcher with the International Organization for Migration in Bishkek, shares such concerns. An estimated 2.2 million Uzbeks work in Russia, and Uzbekistan is not slated to join the EEU. Accession into the new bloc is also unlikely to stem hostility to the Kyrgyz among ethnic Russians. “Even if some legal protection is available (after accession), the situation is complicated by rising xenophobia in Russia,” said Aida Baijumenova, a researcher with the Kyrgyz rights group Bir Duino who regularly interviews migrant workers in Russia.